The Alberta NDP government is spending $624 million to reverse cuts to health care, education and human services proposed by the previous PC regime. The Alberta NDP government is planning to spend $624 million to reverse cuts to health care, education and human services proposed by the previous PC regime. If passed, Bill 3, the interim supply bill, will fund the 12,000 new students expected to enroll in Alberta schools this fall, freeze tuition at post-secondary institutions for two years and add $500 million to the health care budget. The funding would prevent the loss of 1,500 health care workers, according to Health Minister Sarah Hoffman. 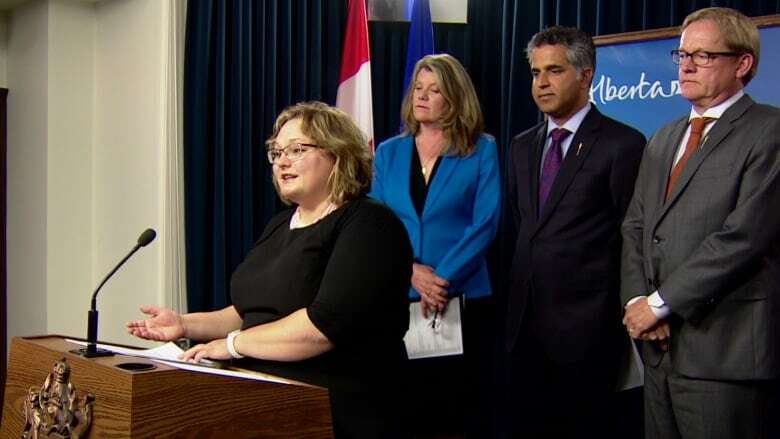 "We all know that Albertans would have been negatively impacted by the cuts proposed by the previous government's budget," she told reporters at a news conference at the Alberta legislature Thursday morning. The human services ministry will receive another $39 million to improve child intervention services, women's shelters and housing for families affected by violence. Human Services Minister Irfan Sabir said he would like to see funding restored to the office of the child advocate which was cut by the previous government. "We would like to see more funding and more independent oversight, to make sure the services we are providing are watched by somebody independent so that the public has trust and confidence in those services." In addition to the two-year tuition freeze, the government is reversing a 1.4 per cent cut to post-secondary institutions and increasing base funding by two per cent. The Wildrose Party is concerned the NDP doesn't know where the money is coming from and that they may have to borrow to meet their spending commitments. They focused on a statement made by NDP house leader Brian Mason in the legislature that ten per cent of the interim supply bill would be new spending. "In addition to the $5.7 billion the Progressive Conservative budget had planned to take on this year, we're concerned that the NDP's hole in their budget will add another $2 billion to that figure," said finance critic Derek Fildebrandt. The PC government under former premier Jim Prentice introduced a budget in March which was never passed. Prentice's government was defeated by Rachel Notley and the NDP on May 5. Bill 3 would allow the government to fund essential operations until a full budget is introduced in October. The government plans to raise corporate taxes by two percentage points on July 1, and end the ten per cent flat tax for people earning incomes over $125,000. Due to inaccurate information provided by the government, an earlier version of the story incorrectly stated that the government was spending $682 million. The correct figure is $624 million.